The voluntary organisation that I do some work for has been running a campaign to try to get men between the ages of thirty-five and fifty-five to open up and talk about their feelings. To encourage them that rather than wallow in the past, and seek solace in bottles of hard liquor they should instead find some support, and enjoy journey down the home straight before they encounter the long white tunnel. It is during that twenty year period where all kinds of things go wrong, these middle-aged men become emasculated, they lose their mojo, and the steady decline begins. Though Viagra and hair replacement treatments may temporarily solve some problems, a great deal of personal issues are stored and stewed over, before the irreparable cracks begin to show. ‘The Browning Version’ is about a man on the decline, in fact this man is quite literally on his way out. 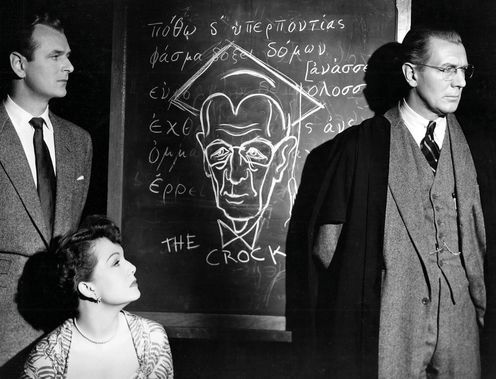 Michael Redgrave plays Crocker-Harris, a classics teacher who lectures at a posh boy’s school. During an assembly the headmaster announces to the gathered spotty mass that Crocker-Harris is leaving the school because of health reasons at the end of the term. The Lower Fifth boys are jubilant that the stuffy teacher they cruelly refer to as ‘The Crock’ is departing. Crocker-Harris realises in his final few days at the school that everyone hates him, well almost everyone. It is Crocker-Harris’ relationship with Taplow, a smug little swot, that leads to the pivotal and poignant ending of the film, which I won’t spoil, but let’s just say there’s a good old-fashioned monologue. Taplow gives Crocker-Harris Robert Browning’s translation of the story of Agamemnon, which provides the title of this film, and the parting gift provokes an unexpected reaction. Crocker-Harris has a host of problems, his wife is promiscuous and puts herself about, getting rather close to several male faculty members, including the science teacher Mr Hunter, who is everything that Crocker-Harris isn’t. The school boys adore Hunter, because he makes learning fun. Then there’s Crocker-Harris’ replacement who teaches human nature, a modern alternative subject to the classics. Crocker-Harris is not just leaving, the subject he is, or should I say was most passionate about is getting removed from the curriculum. Adapted from Terence Rattigan’s play ‘The Browning Version’ contains unforgettable dialogue, and even a scene which features cricket. Yes, the greatest sport on earth is showcased in glorious black and white. As Fletcher, one of the school’s finest pupils and an FEC (Future England Captain) scores another classy century in what is to be his final game. As Crocker-Harris leaves seemingly with his head down in a defeated fashion, Fletcher’s time at the school ends in glory. Although Redgrave undoubtedly shines as Crocker-Harris, the supporting roles of Jean Kent as Millie Crocker-Harris and Nigel Patrick as Mr Hunter create wonderful tension. The trio feature in some unforgettable scenes that feel alive, similarly to what might occur on stage, and this was testament to Anthony Asquith’s steady direction, which isn’t at all flashy or overblown, yet challenges the definition of what it is to be theatrical. Many lessons can be learnt from ‘The Browning Version’ for aspiring directors and actors, both in terms of how to successfully adapt a play, and in the case of Michael Redgrave, how to portray a character who realises that his life is slipping away from him. 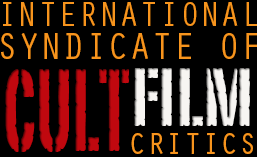 This entry was posted in Reviews and tagged Anthony Asquith, Michael Redgrave, The Browning Version. Bookmark the permalink.